More and more products from mass and specialty brands are looking to tap into the rapidly growing market of consumers who are gluten-intolerant or simply believe that skipping gluten is healthier. But given the reality that formulating truly tasty gluten-free versions of many foods isn’t so easy, how many products have the confidence to trumpet -- rather than play down -- the gluten-free angle in their marketing? 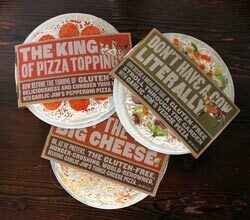 Garlic Jim’s -- a new, gluten-free retail frozen pizza line from the restaurant chain of the same name -- is doing just that, with unique, humorous packaging that straightforwardly takes on consumers’ largely low expectations for the taste of gluten-free offerings. Garlic Jim’s Famous Gourmet Pizza is a predominantly franchised, home-delivery-driven chain based in Everett, Wash., with locations in Washington, Oregon, California, Idaho and Colorado. The restaurants began offering patrons gluten-free pizzas in 2008, and the pizzas’ popularity inspired the launch of frozen versions at retail, starting last year. To date, the products have been available in Western Washington, with distribution in about 160 regional grocery and health food stores, using the same delivery system Garlic Jim’s uses to truck pizza crusts, ingredients and other food supplies from its Everett facility to its restaurants, according to Chief Marketing Officer Max Clough. But that won’t be true for long. Based on the pizzas’ success, Garlic Jim’s is negotiating with traditional grocery distributors to service “healthy” national retail chains, Clough reports. Distribution (targeted to regions identified as gluten-free-receptive) will expand into Oregon in early 2012, and thereafter into California and beyond, he says. In their initial debut at retail, the frozen pizzas -- so far available in veggie, pepperoni and three-cheese varieties -- had very basic packaging largely based on the look of the chain’s pizza boxes. But convinced that packaging would be key in conveying its unique selling propositions to consumers and retailers, Garlic Jim’s hired Seattle-based brand design/experience agency Hornall Anderson to create packaging that could initiate a “conversation” with consumers, says Clough. This genuinely disruptive copy approach is a tongue-in-cheek adaptation of the outrageous but indisputably attention-getting headlines of checkout tabloids, explains Hornall Anderson Creative Director David Bates. “To their great credit, Garlic Jim’s was willing to experiment with this very different approach that uses words to engage with consumers on a human level,” he says. Clough estimates that this packaging -- which debuted about seven months into the launch and was decidedly noticed by consumers and retailers alike -- probably produced an incremental sales lift of 25% to 30%, beyond the new products’ natural growth curve.